Annual art prize sponsored by Channel 4 who screen the prize ceremony and announcement. Either deemed ‘boring’ or ‘controversial’. This entity again produced a large amount of publicity as the winner, Chris Ofili, was the first painter to win since Howard Hodgkin in 1985, and also the artist at this time used elephant dung in his work - cue lots of puns using ‘dung’. List of previous winners, up to 1998: 1984 - Malcolm Morley; 1985 - Howard Hodgkin; 1986 - Gilbert and George; 1987 - Richard Deacon; 1988 - Tony Cragg; 1989 - Richard Long; 1990 - Prize suspended; 1991 - Anish Kapoor; 1992 - Grenville Davey; 1993 - Rachel Whiteread; 1994 - Damien Hirst; 1996 - Douglas Gordon; 1997 - Gillian Wearing. Yearly art prize organised and hosted by TATE. 1999 jury: Bernhard Bürgli, Director of the Kunsthalle, Zurich; Sacha Craddock, writer and critic; Judith Nesbitt, Head of Programming, Whitechapel Art Gallery; Alice Rawsthorn, representative of the Patrons of New Art; Nicholas Serota, Director, Tate Gallery. 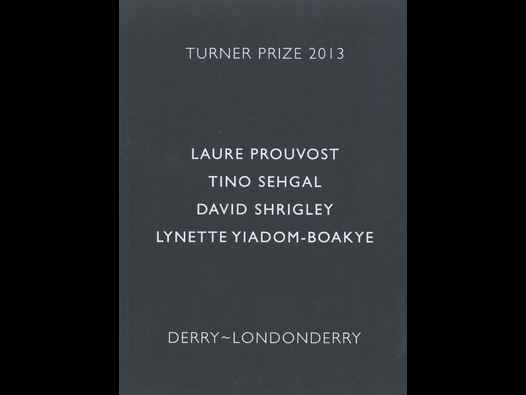 The Turner Prize 1999: An Exhibition of Work by the Shortlisted Artists. Held at the Tate Gallery. 20th October 1999 - 6th February 2000. Featured the shortlisted artists, Tracy Emin, Steve McQueen, Steven Pippin, and Jane and Louise Wilson. The year’s winner was Steve McQueen, making him only the second Black British-born artist to win the prize. The first, Chris Ofili, had won the previous year. 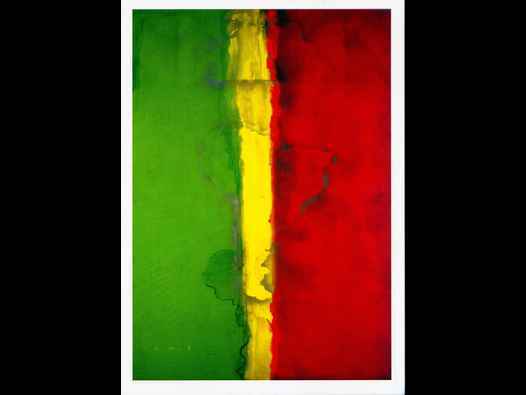 Postcard of Frank Bowling’s Who’s Afraid of Barney Newman, 1968, acrylic paint on canvas, 236.4 x 129.5 cm, presented by Rachel Scott 2006. 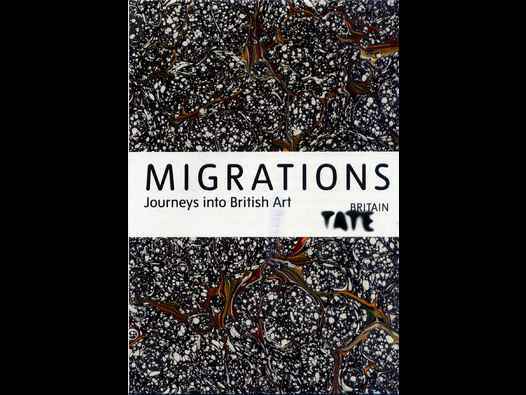 The postcard was one of a 16 postcard pack issued as part of the merchandising of the Tate’s 2012 Migrations exhibition. This work of Bowling’s was included in the exhibition. 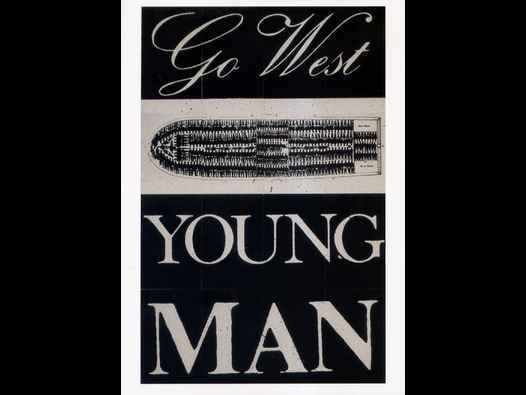 The pack contained cards of work by Benjamin West, Joseph Van Aken, James Tissot, Marcus Gheeraerts II, Jacob Kramer, Oskar Kokoschka, Kurt Schwitters, Sonia Boyce, William Rothenstein, Lubaina Himid, Jan Siberechts, Frank Bowling, Keith Piper, James Abbott McNeil Whistler, and John Singer Sargent. 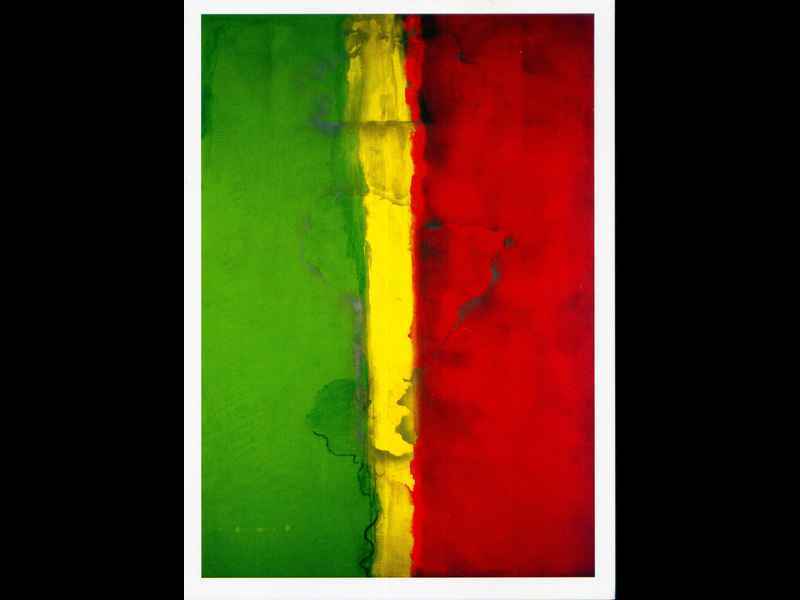 Frank Bowling’s Who’s Afraid of Barney Newman had, a year or two earlier, been exhibited as part of Afro Modern at Tate Liverpool. One of the most important of Bowling’s map paintings was his 1968 work, Who’s Afraid of Barney Newman The painting was, in some ways, a profound homage to one of the giants of American abstract expressionism, and takes as its template Newman’s seminal painting of 1948, Onement, I. [i] The title of Bowling’s homage casually reflected a familiarity on Bowling’s part with the dominant personalities of contemporary art, who had made New York, their home, in much the same way as Bowling himself had. But the title also gives more than a passing nod to the Newman’s own critically acclaimed series, Who’s Afraid of Red, Yellow and Blue. The colours came to signify a particularly conscious type of Black presence. When worn on an individual, the colours confirmed that the wearer aspired to upful living. When adorning musical instruments such as drums, the colours signified that the drums in question were employed in the righteous task of chanting down Babylon. And when the red gold and green colours adorned dwellings, the message went out that no weakheart cannot enter. Thus, Bowling’s use of the colours evoked a multiplicity of diasporic readings that casually collided with his pronounced embrace of modernism and his respect for Abstract Expressionism. The Black presence in South America may have been consistently denigrated, marginalised or even rendered less than visible, but in Who’s Afraid of Barney Newman, the South American land mass, as distinctive in its outline as the shape of Africa, was imagined as an unmistakably Black Diasporic space. It would though, be a serious error to suggest that Who’s Afraid of Barney Newman and other map paintings by Bowling were in any way merely illustrative, or explicit examples of pronounced social narratives. These paintings left an incredible amount to the imagination, because whilst the outlines of continents such as South America were unmistakable, other outlines of landmasses in these paintings emphatically defied conventional recognition. In this regard, Bowling not only created his own worlds by reconfiguring the world that already existed, he also created imagined new land masses, that, try as we might, we could never quite recognise as familiar parts of conventional world maps. Furthermore, whilst in Uruguayan artist Joaquin Torres-García’s Upside-down Map, South America was inverted, in a number of Bowling’s map paintings, South America sometimes appeared to have been reversed, thereby creating something that appeared at once familiar, yet not quite familiar. Whether or not Bowling’s maps were indeed reversed is a matter of visual conjecture or speculation. What is unquestionable however, is the extent to which his map paintings destabilise seemingly emphatic or monolithic constructions of the world, (or, as is the case in many instances, monolithic constructions of South America and South American identity). In other map paintings, Bowling goes further in challenging our sense of familiar cartography by presenting outlines of landmasses that look a lot like amalgamations of the outlines of the African and South American continents. And in so doing, Bowling again proposes a provocative and primary interplay between Africa and Latin America. [i] Barnett Newman (American, 1905-1970). Onement, I, 1948. Oil on canvas and oil on masking tape on canvas, 69.2 x 41.2 cm. In the collection of the Museum of Modern Art, New York. [ii] In the iconography of Rastafari, ‘The Lion of Judah’ symbolises the Emperor Haile Selassie I of Ethiopia, who was crowned in 1930, taking the titles King of Kings, Lord of Lords, Conquering Lion of the Tribe of Judah, Elect of God and Power of the Trinity. Rastafarians hold Haile Selassie in the highest esteem, believing him to be a direct descendant of the Israelite Tribe of Judah, tracing his lineage through the line of King David and Solomon. Further, Rastafarians assert that Haile Selassie is the personage of the Lion of Judah mentioned in the New Testament Book of Revelation. [iv] Nicholas J. Saunders (editor), The Peoples of the Caribbean: An Encyclopedia of Archaeology and Traditional Culture, ABC-CLIO, 2005, p. 235. The work was described, by one curator as follows: “Between the Two My Heart is Balanced is a reconception of a work by French painter James Tissot (1836-1902), which depicts two European women in a boat with a soldier. One woman is ignored, while the other holds the attention of the soldier. In Himid’s version, two women of African descent appear without the soldier’s presence. 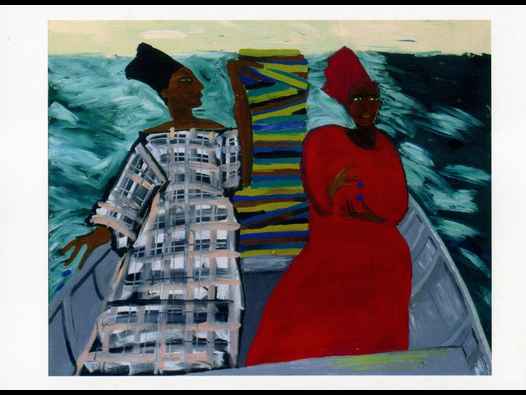 Swathed in African fabric, the women hold each other’s attention as a visible trail materializes in the boat’s wake. Himid’s boldly eloquent , painterly style is skillfully employed in her complex historical revisions. The stunning Revenge series might be viewed as an elegy for those lost during the Middle Passage, whose histories have been ignored, as well as a celebration of those who continue to survive.” Mora J. Beauchamp-Byrd, on Revenge (page 34 of London Bridge: Late Twentieth Century British Art and the Routes of ‘National Culture’, chapter in Transforming the Crown: African, Asian & Caribbean Artists in Britain 1966-1996, Caribbean Cultural Center, New York, 1997, pp. 16 - 45). The Tissot painting referred to by Beauchamp-Byrd is Portsmouth Dockyard (c. 1877). Both the Tissot painting, and this Himid painting figured in the Tate exhibition of 2012, Migrations. 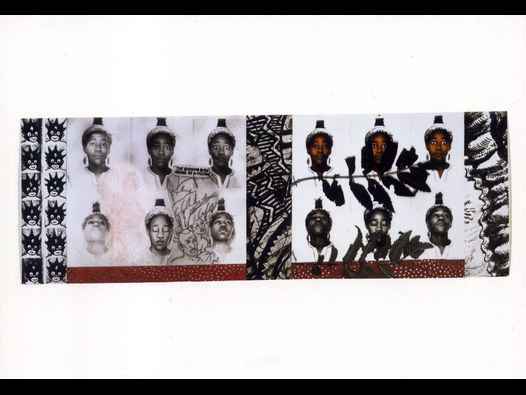 Postcard of Sonia Boyce’s From Tarzan to Rambo: English-born ‘Native’ Considers her Relationship to the Constructed/Self Image and her Roots in Reconstruction, 1987, photograph and mixed media, 124 x 359 cm. 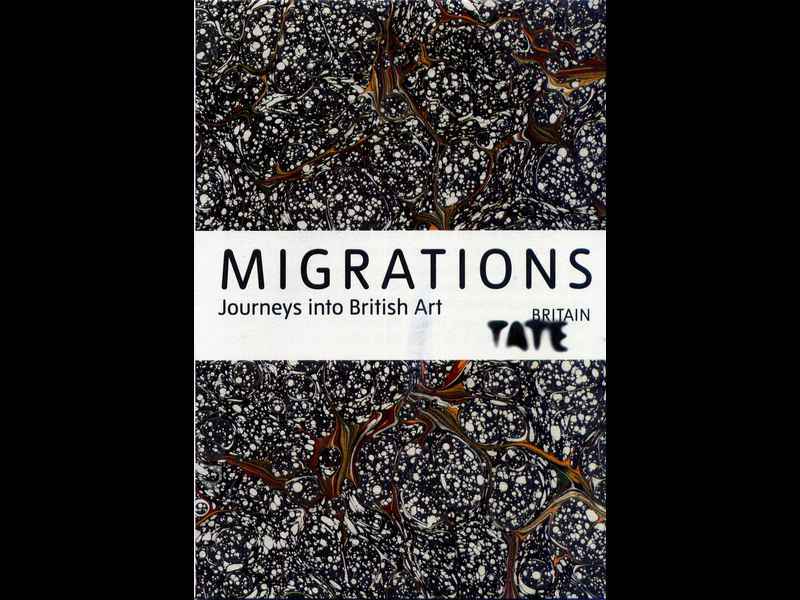 The postcard was one of a 16 postcard pack issued as part of the merchandising of the Tate’s 2012 Migrations exhibition. This work of Boyce’s was included in the exhibition. The pack contained cards of work by Benjamin West, Joseph Van Aken, James Tissot, Marcus Gheeraerts II, Jacob Kramer, Oskar Kokoschka, Kurt Schwitters, Sonia Boyce, William Rothenstein, Lubaina Himid, Jan Siberechts, Frank Bowling, Keith Piper, James Abbott McNeil Whistler, and John Singer Sargent. Sonia Boyce’s From Tarzan to Rambo had, a year or two earlier, been exhibited as part of Afro Modern at Tate Liverpool. 16 postcards pack issued as part of the merchandising of the Tate’s 2012 Migrations exhibition. The pack contained cards of work by Benjamin West, Joseph Van Aken, James Tissot, Marcus Gheeraerts II, Jacob Kramer, Oskar Kokoschka, Kurt Schwitters, Sonia Boyce, William Rothenstein, Lubaina Himid, Jan Siberechts, Frank Bowling, Keith Piper, James Abbott McNeil Whistler, and John Singer Sargent. Boyce’s image was From Tarzan to Rambo: English-born ‘Native’ Considers her Relationship to the Constructed/Self Image and her Roots in Reconstruction, 1987, photograph and mixed media, 124 x 359 cm. Himid’s image was Between the Two my Heart is Balanced, 1991, acrylic on canvas, 121.8 x 152.4 cm. Piper’s image was Go West Young Man, photograph on paper mounted on board, 84 x 56 cm, and Bowling’s image was Who’s Afraid of Barney Newman, 1968, acrylic paint on canvas, 236.4 x 129.5 cm, presented [to the Tate] by Rachel Scott 2006. 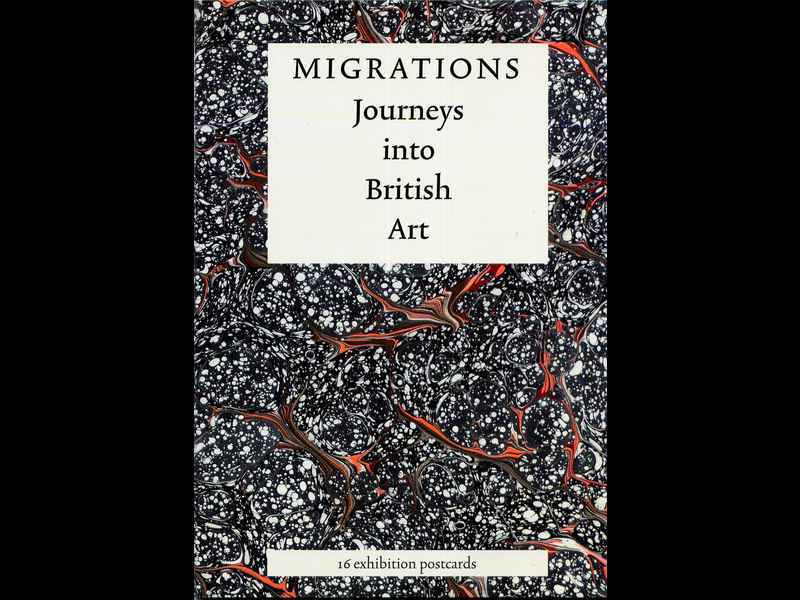 A6 sized, folded-down brochure that accompanied the gallery guide for Migrations: Journeys into British Art, Tate Britain, 31 January - 12 August 2012. One side of the opened-up brochure featured a plan of the exhibition’s various components, and brief introductions to each section: Portraiture and New Genres; Italy, Neoclassicism and the Royal Academy; Dialogues between Britain, France and America; Jewish Artists and Jewish Art; Refugees from Nazi Europe; Artists in Pursuit of an International Language; The Dematerialised Object; New Diasporic Voices, and The Moving Image. The plan of the exhibition’s various components is intended to enable the visitor to navigate the exhibition in a chronological fashion, as well as enabling them to make the most use of the commentaries by three well-known public figures, whose contributions are featured on the other side of the gallery guide. On the reverse of the gallery guide, the three commentaries appear, offered by Bonnie Greer, Michael Rosen and Shami Chakrabati. The back of the folded-down brochure contains other information relating to the exhibition, credits, and other aspects of Tate Britain, such as Tate Members and Tate Patrons. 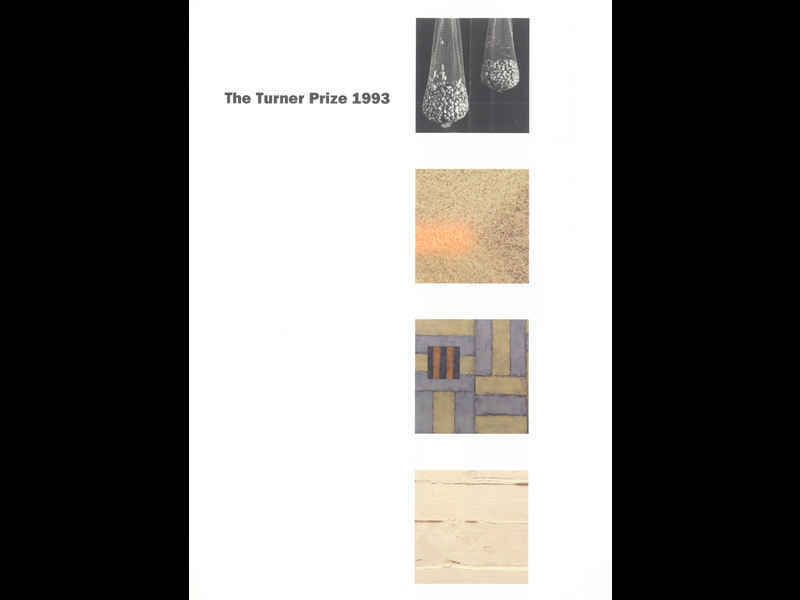 Catalogue (soft cover catalogue/monochrome text on white gloss paper with full colour illustrations/unpaginated) for the Turner Prize exhibition of 1993, held at Tate Gallery, 3 - 28 November 1993. Along with Hannah Collins, Vong Phaophanit, and Sean Scully, Rachel Whiteread was shortlisted for the Turner Prize 1993. 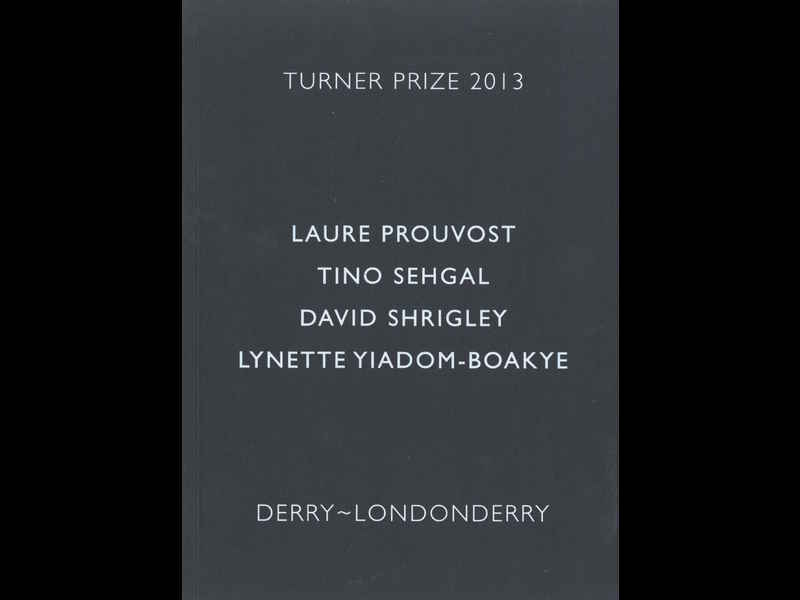 The jury consisted of Iwona Blazwick, Curator of exhibitions in Britain and abroad, Carole Conrad, Art historian and representative of the Patrons of New Art, Declan McGonagle, Director of the Irish Museum of Modrn Art, Dublin, David Sylvester, Art historian, and Nicholas Serota, Director of the Tate Gallery and Chairman of the Turner Prize Jury. The award was, in due course, made to Whiteread. Sponsor’s Foreword, Waldemar Janusczak, Commissioning Editor for Arts, Channel 4 Television.